2.7.6. Beyond Interstitial Water and Solid Phase Chemistry? 4.3.5. Oceanic Plateaus: Plumes or Plate Boundaries? 4.4.3.6. Global Volatile and Mass Cycling in SZs, has it Evolved or Fluctuated through Time? Donna Blackman's research focuses on oceanic spreading centers, investigating how tectonics, mantle flow, and melting along ridge-transform systems vary and what that tells us about the underlying processes. 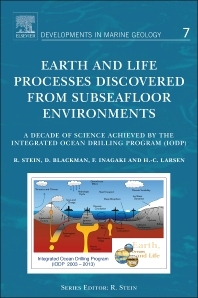 A variety of geophysical methods are used in this research including mapping of seafloor morphology and geology, modeling of gravity data, and measuring subseafloor physical properties using ocean bottom seismographs, towed hydrophone streamers, and scientific drilling, coring and borehole logging. Computer simulations with colleagues test ideas on how deformation of the mantle and crust might occur. Slowly-spreading oceanic rift zones have recently been recognized to undergo episodes where the balance between magmatic and faulting activity evolves over time. During these 1-2 million year periods, newly formed seafloor develops unusual domal highs that are unroofed via long-lived faulting. Study of these 'oceanic core complexes' provides insight into what controls the magma-faulting balance so a major current focus of my research is to document their structure and, thereby, the processes that are responsible for their formation. Another research focus is how minerals develop a preferred orientation during slow viscous deformation in the deep Earth. Seismic waves propagate at different speeds through aligned versus randomly oriented mineral assemblages, so seismic data can detect subsurface deformation patterns induced by flow beneath the rigid tectonic plates. Mineral deformation modes differ depending on in-situ physical conditions and experimental data are still sparse. Numerical models can test the impact of various possible parameters to illuminate the range of outcomes that could occur in Earth's mantle. An aspect currently under study with colleages at Cornell and Paris is whether mineral alignment could result in strong directional dependence of viscosity, that could feedback and alter the style of upper mantle flow. Donna started her geologic studies in California (Pasadena City College and University of California Santa Cruz). She worked at the USGS Pacific Marine Geology Branch then moved to the eastern US for graduate school (MIT and Brown University). Postdoctoral work was completed at University of Washington and Scripps Institution of Oceanography. Since 1992, she has been a Research Geophysicist at Scripps, with a 1-yr interlude at Leeds University, U.K., in the mid-'90s. In 2012, she began a 3-year rotation at the US National Science Foundation, serving as a Program Director in the Marine Geology and Geophysics program.